Toronto, Ontario – November 1, 2016 – In today’s volatile job market it is essential to know how to sell yourself. Your First Moment Earns You More Moments – Stand Out in Today’s Job Market by Alli Mang is filled with tips to make you stand out from the crowd and succeed. Available from Amazon.com and Amazon.ca for $19.99. The days of staying with the same company for your entire career have come to an end. Finance Minister Bill Morneau recently advised Canadians that we need to get used to the “job churn” as today there are more short-term employment opportunities and most people will have a number of career changes in their lives. Finding meaningful employment is getting increasingly more difficult in today’s global job market. In order to get hired you need to fully understand how to sell yourself and know what differentiates you from the competition. Your First Moment Earns You More Moments is a concise book filled with easy to apply results-oriented principles to help you identify, celebrate and own the power of knowing what makes you a stand out. It is an urgent call-to-action to understand how to sell yourself: who are you, your personal values, your expertise, your mindset and your reputation – which is your personal brand. Today, when we have access to almost everything a buyer, a customer or decision maker could want in the world, your priority is to figure out what is your personal brand. Whether you are starting out in your career, or are much more established but have never thought about how important personal branding is for your success, you need to start developing it now. This clarity and focus will make it easier for others to find you, hire you and promote you with confidence. “When you clearly understand what makes you unique and marketable, you are well on your way to establishing your winning personal brand,” adds Mang. •	Create a customized plan of action to help you better your current professional position. •	Learn how to sell, present, promote and pitch your expertise in a winning way to get jobs, leverage your current situation and further your career. •	Create your personal brand and marketing toolbox that will immediately get you noticed for the right reasons by decision makers. •	Master easy to apply, tested and proven, results-oriented branding, sales and presentation strategies. Your First Moment Earns You More Moments inspires readers at various stages of their professional life to dig deeper within, to achieve even greater personal satisfaction and professional success. 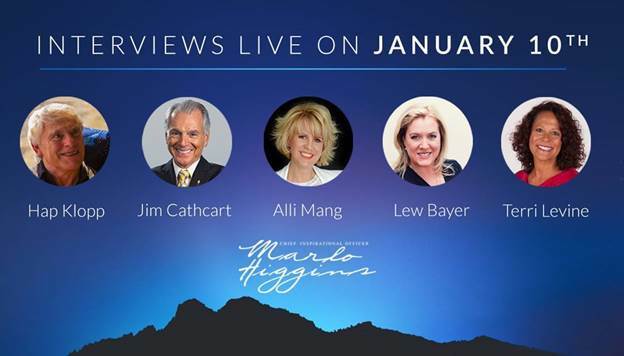 Multi-Million Dollar National Brand Spokesperson Alli Mang is an award-winning, results-oriented sales and personal branding expert who helps her clients capitalize on how to sell themselves with optimal success. She has built her 31+ year career thriving in a working environment where the pressure to deliver results is measured by the minute; not by the day or the week. Her success stems from working on both sides of the entertainment industry – as producer of multiple concert events, as performer/actor in nearly 100 National commercials, stage productions and TV, as well as clocking in over 1400 hours of LIVE television, unscripted hosting on the worldwide home shopping network. Alli is also the Director of The Leanne Mang Foundation Inc., dedicated to providing grass roots support for adolescents dealing with mental illness with a focus on suicide prevention. Alli Mang’s other books include: Sold Out, How to Reach Your Full Potential in Sales; Your First Moment Earns You More Moments – Stand Out in Today’s Job Market and the soon to be released My Force of Life – Living Through the Loss of a Loved One. Visit www.allimang.com for more information. This was me four years ago, February 1, 2010. An orange sized tumour had been removed from the mesenteric wall of my small intestine after 4 hours in the OR. At this moment, we didn’t know if the tumour was malignant or not and wouldn’t know until it was biopsied a month from now. 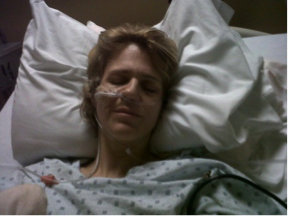 Because of the type of surgery, I had a tube in my nose (as you see in the picture) that ensured that the bile would properly leave my body (which is common practice for this type of surgery). As a result, I couldn’t eat or drink for 7 days. Try doing that when people bring in their steaming hot Tim Horton’s coffees and cream cheese bagels and when people send fruit baskets! What got me here? Ignoring health signs and thinking I had all the time in the world to live my life to its fullest. I was in the middle of my last long run before the Mississauga, marathon. I had come within 2 minutes of qualifying for the Boston marathon and knew that if I managed my race well, that I would have a real shot at qualifying. I remember the entire run was a challenge. I felt like I was sprinting through water and getting nowhere. At the 23 km mark of 34 I was planning to do that day, I was doubled over sitting on the curb waiting for my husband to pick me up. Who would have thought the days and weeks and months of me doubled over in pain wasn’t just me being a little ‘lactose intolerant’? It took me a full year to recover and I haven’t been able to run long distances since. Do you I want to run my seventh marathon? YES! This blog is dedicated to highlighting people who are fighting the good fight and working past their own obstacles to make the most of their lives.